It is with great sadness that we announce the death of Bob Cook, our organist at Frenchay Chapel and UMB for many years. Bob passed away at home on 18.11.2014 aged 75. He is survived by his brother and his niece. Please get in touch if you wish to know about funeral arrangements. "I am so sorry - I did not know Bob well but very much appreciated his music and how reliable he was in support of service leaders. A sad loss for us all but especially the Bristol congregations. My thoughts and prayers are with you and also of course Bob's family at this time." "I was very sad to hear of Bob's death and would like to send my thoughts and sympathy to his family and to you all in Bristol. I didn't know Bob well, but on the occasions I met him, he was helpful and generous. A lovely man." "This is very sad news indeed and such a shock. My thoughts, prayers and love are with his family – and with all of us here who had such a strong affection for Bob and gratitude for all he gave to our community." "We are so sorry to have this news – a chat with Bob – not to mention his playing – was a highlight of our occasional visits to Frenchay." "Please accept our deepest sympathies on the passing of Bob Cook and convey our condolences to his family. 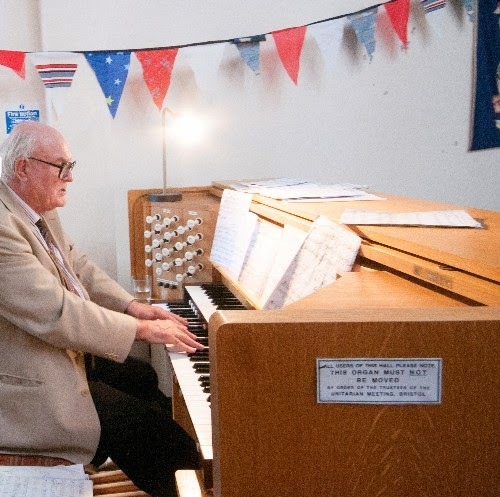 I only knew Bob from the work he did at Frenchay Chapel when he played the organ for me at my services, and he will be sorely missed, not only by me but by the many friends and colleagues that he had for he was one of those truly gentle men."